The appetite for solar in America's southeast is growing. On October 2, 2010, Mississippi Solar's Will and Carolyn Hegman are serving up some mouth-watering, cost-effective ideas to feed that hunger during their second Annual "Down on the Farm" solar tour. The tour is part of the non-profit American Solar Energy Society's National Solar Tour, the world's largest grassroots solar event. Over 646 tours are taking place across 48 states, with more coming online each week. 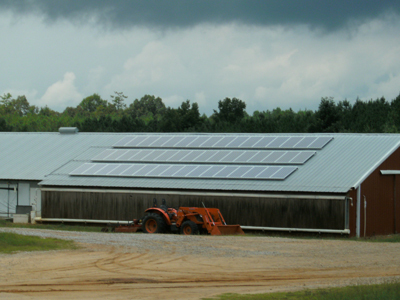 The “Down on the Farm Solar Tour” takes place from 9 am to 4 pm at 211 Popes Road, Carthage, Mississippi, 39051. Guided tours, which run every two hours beginning at 9 am, will highlight three distinctly different grid-tie installations. The first is a 2.4 kW solar carport ready for Tennessee-made electric vehicles rolling off assembly lines next year. Also featured is a ground-mount system with battery back-up. 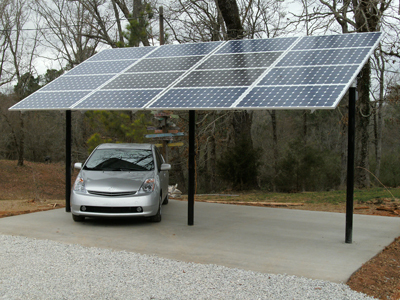 This 2.4 kW solar carport is equipped to produce electricity to power Tennessee-made electric vehicles rolling off assembly lines next year. It will be showcased at the Oct. 2 Down on the Farm Solar Tour, part of the American Solar Energy Society's National Solar Tour, world's largest grassroots solar event. But the solar solution that’s really stirring up some excitement is the 8.4 kW solar electric (PV) solution on a chicken house at Spencer Pope Farms. Solutions like this 8.4 kW, electricity-generating solar PV system on a chicken house are reducing the enormous monthly energy bills Mississippi poultry farmers face each month while bringing federal tax credits to the table. There are 8,000 poultry farms across the state. If each of them were solar-powered, people could offset nearly 10% of the state’s energy consumption with clean, renewable energy – and save these farmers a lot of scratch. “Poultry farming is an energy-intensive business,” said Mississippi Solar co-founder Will Hegman. “Enormous tunnel fans are required to ventilate chicken houses. Lighting adds to the cost. There are close to 8,000 poultry farms in the State of Mississippi. If we were able to solarize all those businesses, we could offset around ten percent of the entire state’s energy needs,” he said. More importantly, says wife Carolyn, solar can help poultry farmers reap federal tax credits of up to 30% while saving money on their electric bills. “Solar can really change the life of a poultry farmer, who has astronomical electric bills, particularly in these hot Mississippi summers,” Carolyn explained. “This technology has the potential to benefit everyone,” she noted, “Solar can cut costs for home owners, farmers, boat houses, horse barns -- and now chicken houses. In addition to learning why solar is a good business investment and how easy it is to get started, highlights of the day include the opportunity to meet the solar race car team from Choctaw Central High School, 1st place winners of the recent Hunt-Winston Solar Car Challenge. 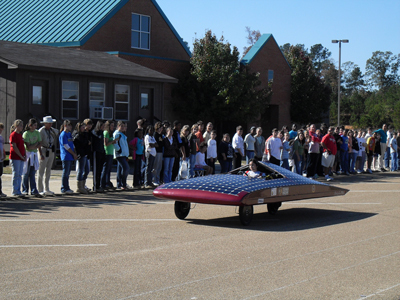 Their solar-powered car won the divisional race from Texas Motor Speedway to Boulder, Colorado. Grilled chicken legs will be served throughout the day. Winners of the recent Hunt-Winston Solar Car Challenge will be showcasing their solar-powered race car during the Oct. 2 “Down on the Farm” solar tour. The Choctaw Central High School team won the divisional race from Texas Motor Speedway to the American Solar Energy Society's headquarters of Boulder, Colorado this summer. Carolyn says Mississippi Solar’s been working to get the people who best know education involved in their efforts: teachers from surrounding schools. “They’re now sponsoring their own solar day at school. The schools have taken the torch and now the teachers are carrying it for our kids,” she said. This is the second year the Hegmans have participated in the National Solar Tour. Now in its 15th year, the Annual American Solar Energy Society (ASES) National Solar Tour features open house tours of thousands of solar-powered homes, businesses, and public agencies. It’s neighbors introducing solar-hungry neighbors to the technologies they are using to 1) slash monthly energy bills, 2) reduce environmentally harmful carbon emissions, 3) assert their energy independence and 4) enjoy rich tax credits and cash incentives as they improve their property values.